Are you struggling with stubborn pockets of fat that you just can’t seem to get rid of? Does it seem like exercise and diet aren’t enough to help trim your physique? If so, you aren’t alone. Plenty of other people struggle with losing weight just like you are. Thanks to an innovative new procedure known as CoolSculpting, you can get the results you desire without any surgery. Not only are results long-lasting, but CoolSculpting is completely safe and can help to leave you looking stunning from each and every angle. When you think about trying to get the fat off your body, what is the first thing that comes to mind? Probably not using the power of cold to get the job done, that’s for sure. However, CoolSculpting can actually help to selectively eliminate stubborn fat pockets that have been driving you crazy for quite some time. 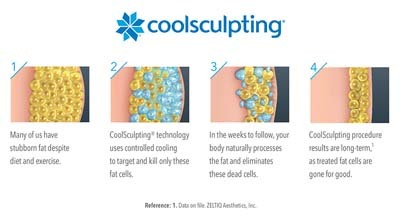 CoolSculpting’s innovative new technology is aimed at delivering a precise deep-cooling to effectively target those hard-to-lose fat cells that lie underneath your skin. This process is known as Cryolipolysis. The frozen fat cells will end up crystallizing before being naturally eliminated from your body. Over the course of a couple months, your body is going to naturally process all of the excess fat and eliminate dead fat cells. In the end, you are going to be left with a whole new you that is more lean and sculpted. One of the best things about the whole CoolSculpting non-surgical procedure is that you don’t have to worry about going through any extensive surgery to get rid of the excess fat. This fat-freezing procedure has been cleared by the FDA. You also don’t have to worry about any lengthy recovery time, which is why this is one of the most popular sculpting procedures today. Instead of having to worry about the fat coming back time and time again, CoolSculpting gets rid of it once and for all, and you can maintain your slimmer shape with a healthy diet and exercise. One of the first things you need to do is to speak with Dr. Paine to determine which areas you want to treat. CoolSculpting is most commonly used to treat the abdomen, flanks, and bra area. During the CoolSculpting procedure in Beckley, the handheld CoolSculpting device will be positioned directly on your body. Once in place, a controlled cooling is used to freeze the underlying fat. No anesthesia is required, so you are free to check your email, read your favorite book, watch television, or even take a nice nap throughout the hour-long procedure. Since the procedure is virtually painless, you will be relaxed and rested in no time. Instead of only being able to reduce fat in one part of your body, you can now reduce fat from multiple areas all in one session. While the results from just one treatment are often remarkable, further treatments can help to enhance the results even further for a greater slimming and reduction of fat. Working along with Dr. Paine at Mountain State ENT & Aesthetics in West Virginia, you can develop a treatment plan that is going to work for your specific needs and wants. Since the CoolSculpting procedure isn’t about surgery, you don’t have to worry about waiting a long period of time to recover. You can get back to all of your favorite activities within a short period of time—often right after your treatment. Whatever you love to do, get out there and do it. No need to wait. During the next few months, your body is going to continue eliminating and processing all of the fat cells that you had treated during the procedure. As soon as the fat cells have been taken care of by your body, they are gone once and for all, and your new shape can be kept that way as long as you stay healthy, exercise, and eat right. Take the time to discuss all of the available options for eliminating excess fat with someone who has your best interest at heart. Dr. Paine understands what you are going through, and what can be done to eliminate your stubborn fat. Once you know what to expect, you can begin the process of sculpting a whole new you with the help of a board-certified physician.